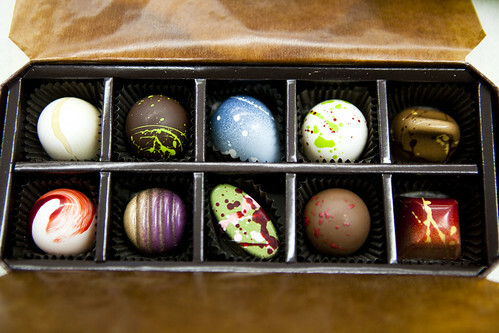 Several weeks ago, Norman Love Confections graciously sent me a sampler box of their upcoming limited holiday edition. Sure, it seems early to shop for Christmas but time is passing a lot sooner than I’d like these days. The next thing I know, I have to rush to the stores and start shopping for friends and family! The chocolates were wonderful. They’re not too sweet, gorgeous and festive-looking, and the chocolates were well tempered that the coating is crisp and the filling is smooth (unless we’re talking praline). This collection of chocolates are available in November. I suppose I’ll get some for my co-workers when they arrive to my local stores. 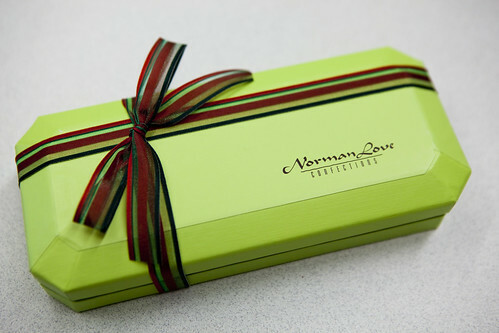 Norman Love chocolates are always a great gift idea. The response is always the same, “wow, these are too beautiful to eat” and then they taste one and art goes out the door and they savor the delicious and sinfulness of each chocolate! Each chocolate is a piece of art though.